Bu çalışmanın amacı onuncu sınıf öğrencilerinin ikinci dereceden denklemleri çözme başarılarını incelemek, tam kareye tamamlama, çarpanlara ayırma, ikinci dereceden denklem formülü olmak üzere farklı çözüm yollarını kullanma eğilimlerini araştırmak ve öğrenciler tarafından yapılan hataları belirlemektir. Çalışmanın örneklemini Türkiye’nin kuzeyinde yer alan bir lisede öğrenim gören 50 onuncu sınıf öğrencisi oluşturmaktadır. Veriler ikinci dereceden denklemlere yönelik 9 sorunun örneklemdeki bütün öğrencilere uygulanmasıyla elde edilmiştir. İçerik analizi yapılarak veriler analiz edilmiş, yüzde ve frekans değerleri verilerek tanımlayıcı istatistiksel bilgi sunulmuştur. Bunun yanı sıra, öğrencilerin cevaplarından alıntılar yapılarak hata türleri gösterilmiştir. Bulgular, öğrencilerin ikinci dereceden denklemleri çözmekte zorlandıklarını ve çözerken çeşitli hatalar yaptıklarını göstermektedir. Öğrencilerin ikinci dereceden denklemleri çözerken yaptıkları hatalar cebirsel ifadeler, kesirler, negatif sayılar, ikinci dereceden denklem çözme kuralları, hesaplama ve cebirsel sadeleştirme gibi konuları tam öğrenememesine dayalı zayıflığından kaynaklanmaktadır. Ayrıca, öğrencilerin genellikle ikinci dereceden denklemleri çarpanlara ayırma yöntemiyle çözme eğiliminde oldukları sonucuna ulaşılmıştır. The purpose of the present study was to investigate tenth grade students` achievement of solving quadratic equations, to examine their tendency of using different solution ways which are completing the square, factorization and quadratic formula and to determine the errors made by students. 50 tenth grade students of a high school in northern part of Turkey constituted the sample of the study. In data collection, 9 open-ended questions related to quadratic equations was carried out all students in the sample. Data were analyzed through content analysis and also descriptive statistics: percentage and frequency were presented. Besides, the errors made by students were showed by quoting from their answers. The findings showed that most of the students have difficulty in solving quadratic equations and make various errors. The students’ errors in solving quadratic equation were tend to be due to their weaknesses in mastering topics such as algebra, fractions, negative numbers, the rules of quadratic equations` solution methods, calculation and algebraic simplification. In addition to this, the findings revealed that students were usually in tendency to use factorization in order to solve quadratic equations. Baki, A. & Kartal, T. (2004). The characterization of high school students’ algebra knowledge in terms of conceptual and operational knowledge. 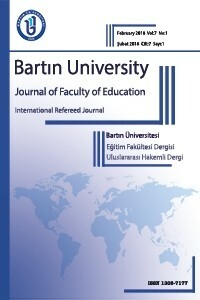 The journal of Turkish Educational Science, 2(1), 27-46. Chazan, D. (1996). Algebra for all students? Journal of Mathematical Behavior, 15, 455-477. Dede,Y.,Yalın, H. ve Argün, Z. (2002). The errors and misconceptions of 8th grade students in learning of the concept of variable. UFBMEK 16-18 Eylül, ODTÜ, Ankara. Didiş, M. G., Baş, S., & Erbas, A. K. (2011). Stevens’ reasoning in quadratic equations with one unknown. The Seventh Congress of the European Society for Research in Mathematics Education (CERME-7). University of Rzeszów: Poland. http://www.cerme7.univ.rzeszow.pl/WG/3/CERME7_WG3_Gozde.pdf. Erbaş K., Çetinkaya, A. & Yaşar E. (2009). Student difficulties and misconceptions in solving simple linear equations, Education and Science, 34(152):44-59. Ersoy, Y. & Erbaş, A., (2000). Student difficulties in algebra teaching: The views of teachers, IV. Science Education Conference Proceedings. Hacettepe University Education Faculty. Ankara. Hacısalihoğlu, H.H., Mirasyedioğlu, Ş. & Akpınar, A. (2004). Elementary ilköğretim 6-7-8. grades mathematics teaching (First Edition), Ankara: Asil Publishing. Jinfa, C. (1998). Exploring students' conceptual understanding of the averaging algorithm. School Science and Mathematics, 98(2), 93-98. Kaput, J.J. (1999). Teaching and learning a new algebra with understanding. In E. Fennema & T. Romberg (ed.) Mathematics classrooms that promote understanding (p.133-155). Mahwah, NJ: Lawrence Erlbaum Associates. Katz, J. V. (1997). Algebra and its teaching: An historical survey. Journal of Mathematical Behavior, 16(1), 25-38. Kieran, C. (1992). The learning and teaching of school algebra. In D. A. Grouws (Ed. ), Handbook of research on mathematics teaching and learning (pp. 390-419). New York: Macmillan. Lima, R. N. (2008). Procedural embodiment and quadratic equations. Retrieved from: http://tsg.icme11.org/document/get/701. MacGregor, M. (2004). Goals and content of an algebra curriculum for the compulsory years of schooling. In K.
Makonye, J. & Nhlankla, S. (2014). Exploring ‘Non-Science’ Grade 11 Learners’ Errors in Solving Quadratic Equations. Mediterranean Journal of Social Sciences, 5(27), 634-644. McCormick, R. (1997). Conceptual and procedural knowledge. International Journal of Technology and Design Education, 2: 141-159. MoNE, TTKB (2005). Secondary education curriculum and workbook (9, 10, 11 ve 12. Grades), Ankara. Norasiah, A. (2002). Diagnosis jenis kesilapan dalam hierarki Pembelajaran Serentak. [ Error type diagnosis in learning simultaneous equation]. Master of Education Research Project, Universiti Kebangsaan Malaysia. Parish, C.R. & Ludwig, H.J. (1994). Language, intellectual structures and common mathematical errors: a call for research. School Science and Mathematics. 94(5), 235-239. Roslina, R. (1997). Keupayaan algebra asas pelajar tingkatan empat sekolah menengah kerajaan Daerah Hulu Langat. [The ability of Form Four students in basic algebra]. Master of Education Research Project. Universiti Kebangsaan Malaysia. Sarwadi, H. R. H., & Shahrill, M. (2014). Understanding students’ mathematical errors and misconceptions: The case of year 11 repeating students. Mathematics Education Trends and Research, 1-10. Schoenfeld, A. H. (1985). Mathematical Problem Solving, Academic Press, Orlando. Snell, K. S. (1958). The solution of quadratic equations. The Mathematical Gazette, 42 (340), 101-103. Stake, R. E. (1994). Case studies. In N. K. Denzin, & Y.S Lincoln (Eds. ), Handbook of qualitative research (pp. 236-247). Thousand Oaks, CA: Sage. Usiskin, Z. (1988). Conceptions of school algerba and uses of variables. The Ideas of Algebra K-12, 8-19. Vaiyavutjamai, P., & Clements, M. A. (2006). Effects of classroom instruction on students’ understanding of quadratic equations. Mathematics Education Research Journal, 18(1), 47-77. Yıldırım, A. & Şimşek, H. (2004). Qualitative research methods in social science. Ankara: Seçkin Publishing. Zakaria, E. & Maat, S., M. (2010). The analysis of students` error in learning of quadratic equations. International Education Studies, 3(3) 105-110.